Bored? Have nothing to do? 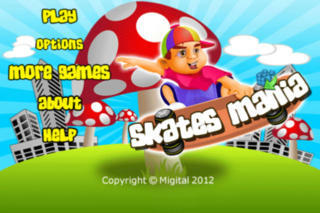 Get Skates Mania now - Extreme skateboarding is now in your pocket! Speed through the mushroom world or the Pipe world or even through the city. Whether your skill level is beginner, intermediate or expert, this game will keep you entertained and challenged at all times! It will take away all your boredom and help you pass your time well! Meet the challenge of making your Skates Man jump over all the hurdles without a collision. Race against the clock to land the most number of flips and jumps. Collect the powers ups to increase your score but avoid the obstacles. Exciting Themes challenging your Skates Man capabilities. City world, Mushroom World and Pipe World with corresponding hurdles. Three Exciting Themes with 3 Adventure levels in each theme. Jump, Bend and Boost buttons to guide the Skates-man through difficulties. There are both positive and negative powers, so be careful while crossing the hurdles. Cross all hurdles and collect the power ups to increase your score and clear the level quickly! Skates Mania challenges your ability to observe and your concentration skills. It is a fast paced game where you only need to accelerate or jump over the obstacles in your way and get the scores as high as you can!